Everywhere I look, I see blossoms bursting open, unfurling their petals to welcome lengthening days and warm breezes that herald the approach of spring. The quality of the ‘Robin’ Knit Top* by Collectif is so good. The woven knit fabric feels light and silky in your hand, yet it’s still warm when you wear it. It’s comfortable, easy to wear, and effortlessly fits into a vintage wardrobe for either a 1940’s, or early 1950’s look. A versatile piece for sure! Also, I adore the sage color they’ve called ‘antique green’, and all the details like the lace pattern, gathered sleeve heads, pearl buttons, and dainty collar really make for a simply gorgeous top. I can see why the Collectif brand is so popular. The quality is fantastic, and the styles they produce are so charming and perfect for vintage appropriate looks. 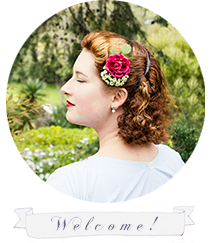 I must say, I think that Collectif could easily be named as one of my top vintage reproduction brands ~ which is saying something considering all the amazing brands out there! Do you have any favourite pieces from Collectif? Or maybe another reproduction brand? I’ve actually started collecting Vintage Reproduction Brands on a Pinterest board in hopes that I can list all of the places to shop the best vintage reproduction. Please do tell me your favourite sites so I can check them out and add them to the list!